Australia’s households and small businesses will be at the centre of the dramatic energy transition occurring around us, and will play a critical role in the switch to 100 per cent renewable energy, and saving around $100 billion in costs from the business-as-usual fossil fuel scenario. That dramatic outline is the key takeaway from the final draft of the report of the Electricity Network Transformation Roadmap that has been painstakingly put together over the last three years by the government’s premier research body, the CSIRO, and Energy Networks Australia, which represents the grid owners across the country. The key conclusion is that Australia can and should reach 100 per cent renewable energy for its electricity by 2050, and therefor zero emissions. It can, because the technology is there to do it. It should, because of climate change and the economics. As it concluded in its earlier report in December, this consumer led transition to a grid centred around distributed generation, solar and storage, will save a heap of money in network investment ($16 billion), and network costs to consumers ($100 billion) by 2050. Consumers will play a critical role and lead this transition. 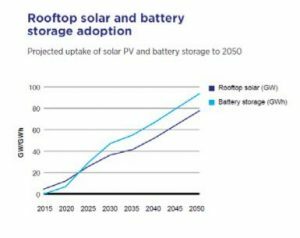 The report suggests that by 2050, households and businesses will have installed a phenomenal 80GW of rooftop solar, accompanied by some 97GWh of battery storage. 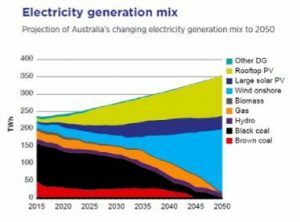 The 10 million households who have distributed energy resources like solar, storage, smart homes and electric vehicles by 2050 will play a critical role in how Australia manages its grid, which will no longer be based around a scenario of centralised baseload and peaking plants. Instead,it will be based around wind, solar, storage and other flexible generation. And the key to providing that flexibility lies in the distributed nature of the grid, and taking advantage of the consumer investment in solar and storage, which will provide half of all the power needed and much of the storage. But the stunning falls in the cost of renewable energy technologies, solar in particular, and of battery storage, means that Australia not only needs to get its transition policies and roadmaps into place, it is running out of time to do so. The risks, the report says, is that without significant market reform and long term climate policy, the transition will be uncontrolled. That, he says, is about ensuring that consumers are reacting to signals of not just how much electricity they are using, but when they are using it. And ensuring that their assets – solar and storage – can be accessed to help manage the entire grid. The big risk, the networks say, is that without the right pricing signals, many customers (at least 10 per cent will simply leave the grid. The key measures, the report says, are having a stable, bipartisan, and ambitious climate policy (40 per cent reduction in 2005 emissions by 2030), cost reflective network pricing (to ensure that peak demand is addressed) and clear transition plans at state level for the local networks. These need to be in place by 2020 or 2021. The CSIRO and ENA are hopeful that the Finkel Review will lay much of the groundwork, although it is fairly obvious to RenewEconomy that if these policies are to be delivered it is going to require a complete change in the nature of political rhetoric around energy policy and energy supply.